Learn to create clever home storage ideas with various built-in options here. Even odd nooks and narrow gaps can be turned into useful storage solutions. When renovating, make it a point to incorporate storage into your interior and furniture. This is pricier but the overall effect will be more streamlined. Here are some practical tips, broken down by storage type with suggestions on where they can be used. Under stairs or in steps, where space is often wasted. Underneath the bed, where drawers are more convenient than loose storage boxes since you can pull them out and see everything at a glance. In bench seating or long wall benches. Underneath platforms for extra-long items like posters or luggage. In dining tables, for daily dinnerware. Full-height wall cabinets create plenty of hidden storage. Done right, the doors can also be interesting feature ‘walls’. At the entrance. A shallow cabinet suffices for shoes, sports gear and outdoor stuff you don’t want the kids to track through the home. In the living area, for AV, CD and DVD storage solutions and more. Opt for full-height kitchen cabinets instead of smaller, wall-hung ones for a more streamlined look. These cabinets also save on dusting since their tops don’t need to be cleaned. As a focal point. Cabinets can be turned into stunning murals by cladding the doors in fabric or laminates. Fabric upholstery also soundproofs a room. As consoles everywhere, for a more linear streamlined look. In the den, hide the TV in a ceiling- or wall-hung cabinet. A quick neat-fix. As a kitchen/breakfast bar for plates and utensils. Also great as everyday food service, display space and a buffet counter during parties. In the bedroom. No space for a vanity? A mirror about the shelf or drawer turns it into a dressing area. In bedside tables, to maximize storage and get a streamlined look. Above the WC, below the wash basin. A boon in small bathrooms. But install them at least 30cm off the floor so they don’t get wet during washing. In the den. Wall-to-wall shelves feel library-like. Instead, use a tall shelf as a room divider. 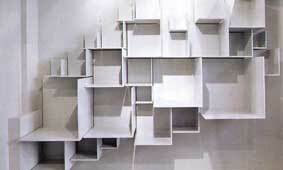 Mobile, modular shelves will allow you to alter the room’s flow. Wall shelves. A solution for small rooms where the floor space is crammed. The shelf unit below designed by Stefan Lie is made up of five different-sized pieces, the modular design is a series of shelves that elegantly cascade down the wall. 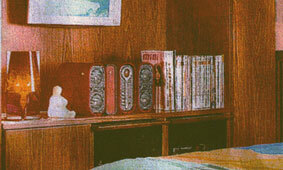 The suspended shelves keep books, documents and knick-knacks away from the working table below. This is especially helpful since there are no drawers. In the shower area, for toiletries. Bath caddies get soggy and suction-cup holders don’t last. In entrances, corridors and bedrooms. Use artful spotlighting to gild displays and previous books. With custom furnishing. The example below shows an alcove-like desk in a bedroom, which runs the width of three door panels, features top hung storage cabinets. Two panels below are left out so you can tuck your feet underneath the desk. You can also add a pull-our table to double the size of the work area. Best of all, you don’t need a chair as you sit on the platform bed . By installing the plasma tv on the wall behind the desk, space is further maximized. In the kitchen, between cabinets for large trays, chopping boards etc. In the bathroom or bedroom, create ‘slots’ for magazines and paperbacks. Especially useful next to the WC. As an extra ‘table’ anywhere. Shallow wall-hung tables can make instant work tables. Hinge it to the wall and fold away if space is tight.